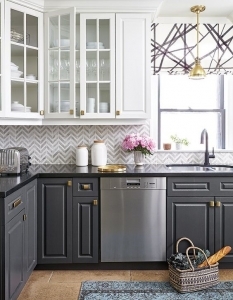 Slowly, on trend colours for Kitchen Renovations are changing from white to grey. 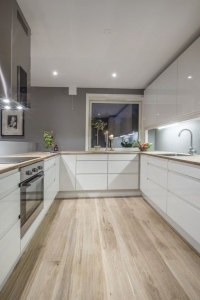 For a long time the ‘all white kitchen’ has dominated nearly all renovated kitchens. Although the base colour for the kitchens we install is still mostly white, we are now seeing a steady rise in kitchen’s whose feature colour is grey. 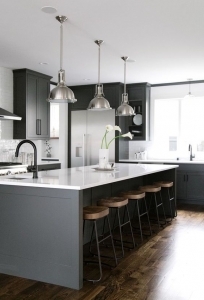 So if you are planning to update your home with kitchen renovations, especially with the intent on house flipping, grey is tipped to be the BIG colour feature now and in the future. Renovator Auctions offers a custom made installation service for all kitchens purchased via our showroom. If you’d just like a few design tips and hints about which colours would work well in your kitchen’s space, we can usually point you in the right direction. But, we find it works best if you’ve done your research about your colour, style and materials preferences before you pay us a visit. There are just some combinations which really work well together. The pic on the left, pinned by Megan Triado, shows how slate grey cupboards can be teamed with steel fixtures and kitchen appliances, dark wood grained floors and stools, and white bench tops and walls. This kitchen is one of the most contemporary of all styles of kitchen renovations. Its sleek simplicity is crisp and easy, easy, easy to keep clean. Angie Loves This’ pin (left) shows how similar shades can be used to create an amazingly different look. Although, this style of kitchen renovations is still modern, the use of warmer coloured tiles and accessories, and the ‘cottage’ cabinet doors offer a gentler ambience. Note – the repetition of the window covering and the geometric tiles. 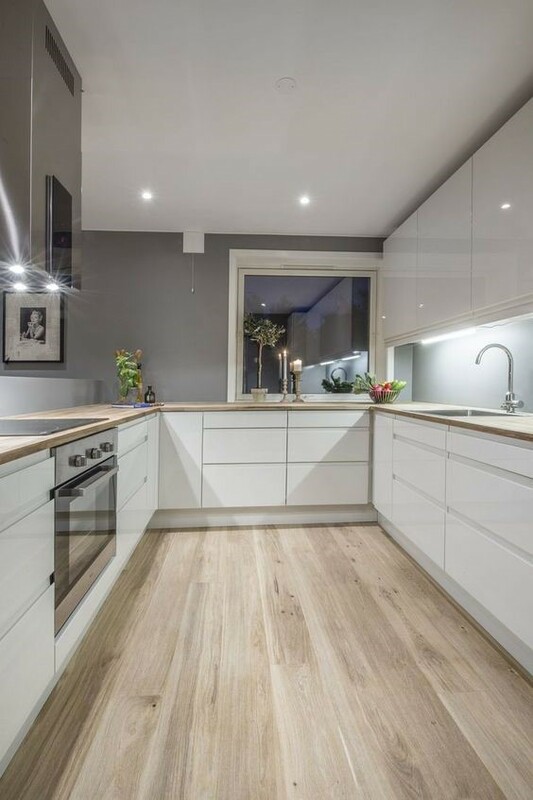 How much would you like to have this ‘no fills or fuss’ kitchen renovation in your own home? Dan Pinson’s Pinterest pic on the left, combines the pale grey cabinetry and steel appliances with marble bench-tops. It’s tied together with pale wooden floors, stool legs and features. 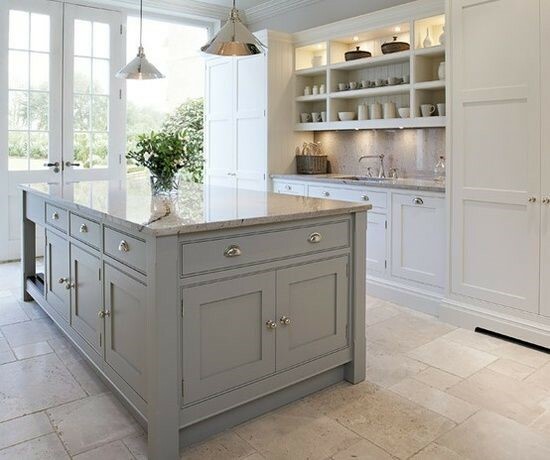 The resulting clean lined kitchen renovations which any of us would be pleased to have. How about being reminded of your dream trip away in France every day, by the French Provincial grey and white kitchen renovations on your left. Hayley Miscellaneous’ pin combines a warm grey preparation bench with brown flecked marble bench tops and grey and brown stone tiles. These colour mixtures work perfectly with the white provincial style cupboards. Bailey Crampton’s pin on the right shows how mixing up grey, white and wood tones can create a new crisp style which is still welcoming and warm. 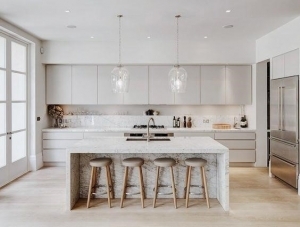 Although the kitchen is relatively small, the style of décor is a perfect example of how white cabinetry can give the illusion of a larger kitchen renovation. Note – the warm, grey feature wall gives the kitchen definition and style. Remember Renovations Auctions offer a custom made kitchens and flat pack installation service. Come and pay us a visit at Renovator Auctions Western Sydney showrooms, 28-34 Orange Grove Road, Liverpool (Warwick Farm), phone: (02) 9822 7883, fill out the form on our contacts page, or email us. For even more inspiration and tips like and follow us on our popular Pinterest and Facebook pages.